Start your visit in early morning at the central meeting point in Madrid, then head out to Toledo, known by many as the second Rome and declared a World Heritage Site by UNESCO. During your tour you will visit the Cathedral of Toledo, the Mirador del Valle, The Monastery of San Juan de los Reyes and Puente de San Martin. Do not miss the opportunity to explore its narrow streets, squares and gardens. Continue on to Segovia, where you will witness the aqueduct, Alcazar and the Cathedral of Segovia. The aqueduct is about 15 km long and takes the water near the actual marsh of Revega. The Azoguejo Square is the best known and best preserved area. Next is the Alcazar, one of the most distinctive castle-palaces in Spain by virtue of its shape, as it looks like the bow of a ship. 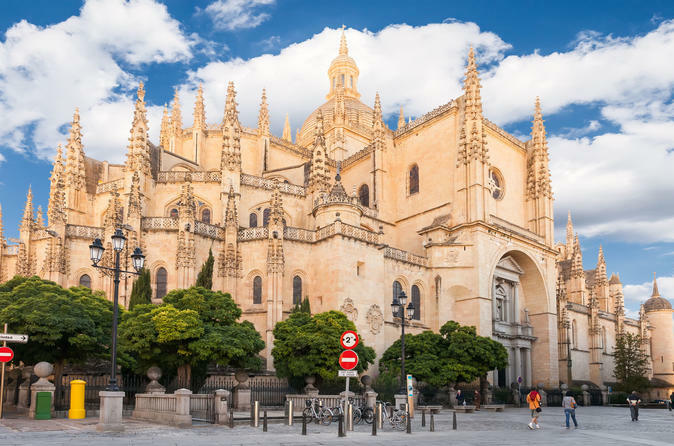 Last, but not least, is the Cathedral of Segovia, a Gothic-style, Roman Catholic cathedral located in the main square of the city of Segovia. There is no doubt this is a tour where you will learn a lot about architecture and history on this Toledo and Segovia guided day tour from Madrid.